(NASA) – About 93 million miles from us lies an immense nuclear furnace spanning 100 Earths. In just one second, it produces enough power to supply the entire United States for nine million years. It is the closest star, our sun. Although its light powers almost all life on Earth, the sun has a dark side. Storms from the sun can knock our finely tuned technological civilization off balance, disrupting satellites, power grids, and radio communication, including the Global Positioning System. Radiation from solar storms can cause cancer in astronauts on unshielded areas, like the moon’s surface. Sometime between the end of 2008 and the beginning 2009, NASA will launch the Solar Dynamics Observatory (SDO) to trace these disturbances back to their origin deep within the sun. SDO will discover how the sun builds up and explosively releases magnetic energy, which powers severe space weather. Heat from nuclear fusion in the sun’s core makes its outer layer churn like a pot of boiling water. Solar storms are born deep in this outer layer, with tangled magnetic fields generated by the sun’s churning electrically conducting gas (plasma). Like a rubber band that has been twisted too far, solar magnetic fields can suddenly snap to a new shape, releasing tremendous energy as a solar flare or a coronal mass ejection (CME). Solar flares are explosions in the sun’s atmosphere, with the largest equal to billions of one-megaton nuclear bombs. Solar magnetic energy can also blast billions of tons of plasma into space at millions of miles (kilometers) per hour as a CME. This violent solar activity often occurs near sunspots, dark regions on the sun caused by concentrated magnetic fields. Sunspots and stormy solar weather follow a cycle that repeats approximately every eleven years, from few sunspots and quiet conditions to many sunspots and active, and back again. Key to predicting solar storms and the solar activity cycle is an understanding of the flows of plasma inside the sun. Magnetic fields are “frozen” into the solar plasma, so plasma currents within the sun transport, concentrate, and help dissipate solar magnetic fields. Currently, the Sun’s activity is at its minimum, but by the time of the SDO launch, the activity level is expected to rise significantly. Although the general process of solar activity and its cyclic behavior are known, many of the details are not, such as exactly what magnetic structures lead to flares and CMEs. These details need to be discovered before solar storm predictions improve, and SDO’s suite of three instruments is designed to do just that. The Helioseismic and Magnetic Imager (HMI) can look inside the sun to map out the flows of plasma that generate solar magnetic fields. Helioseismology traces sound waves reverberating inside the sun to build up a picture of the interior, similar to the way an ultrasound scan is used to create a picture of an unborn baby. 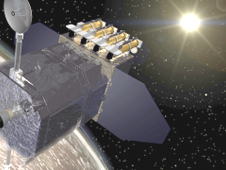 HMI will also be able to measure the strength and direction of the magnetic fields emerging on the sun’s surface. With these capabilities, HMI will help discover the mechanisms causing the sun’s 11-year activity cycle and reveal how magnetic fields become concentrated by active regions, the areas around sunspots. The Atmospheric Imaging Assembly (AIA) will take pictures of the sun’s atmosphere relatively close to the surface where solar magnetic fields suddenly change shape and release energy. It will be used with HMI to link changes on the surface to interior changes. The two instruments together will reveal how active regions concentrate and then violently disperse magnetic fields. Also, as the AIA observes flares and CMEs, scientists can link them to specific surface magnetic structures and interior plasma flows seen by HMI. Just as a hook-shaped structure in Doppler radar of thunderstorms indicates a possible tornado, scientists will discover what kinds of plasma flows and magnetic field shapes warn of imminent solar outbursts. AIA will reveal how much this magnetic shape-shifting, called reconnection, heats the solar atmosphere. It can also indicate how much of a boost reconnection gives to the solar wind, a thin stream of plasma blown constantly from the sun through the solar system and beyond. Some magnetic storms are caused by solar wind. Thus, one needs to understand properties of the solar wind in order to predict those storms. The Extreme Ultraviolet Variability Experiment (EVE) will measure the sun’s ultraviolet brightness. The sun’s extreme ultraviolet output constantly changes. The small solar flares that happen almost every day can double the output while the large flares that happen about once a month can increase the ultraviolet a thousand times in minutes. This harmful ultraviolet radiation is completely absorbed in the atmosphere, which means we can only observe it from satellites. Rapid changes in the ultraviolet radiation of the sun can cause outages in radio communications and affect satellites orbiting the Earth. Increases in solar ultraviolet radiation from flares heats Earth’s upper atmosphere, causing it to expand. The expansion makes the air denser at low-Earth-orbit altitudes, where many satellites fly. The denser air increases the drag on these satellites, slowing them down and causing them to prematurely burn up in the lower atmosphere if there is no more fuel on board to give them a boost. EVE will take measurements of the sun’s brightness as often as every ten seconds, providing space weather forecasters with warnings of communications and navigation outages. Pictures taken at the same time with AIA will tell scientists where the change in brightness came from and whether it was a flare, a CME, or some other event. HMI will reveal the magnetic and plasma flow activity behind the event. Together, SDO’s three instruments will enable scientists to understand when violent solar activity will occur, and discover whether it’s possible to make accurate and reliable forecasts of space weather and climate. SDO is the first mission of NASA’s Living With a Star program, which seeks to understand the causes of solar variability and its impacts on Earth. SDO is being designed, managed, and assembled at NASA Goddard. HMI is being built by Stanford University, Stanford, Calif. The Principal Investigator for HMI is Dr. Phil Scherrer of Stanford. AIA is being built by the Lockheed Martin Solar Astrophysics Laboratory (LMSAL), Palo Alto, Calif. AIA’s Principal Investigator is Dr. Alan Title of LMSAL. 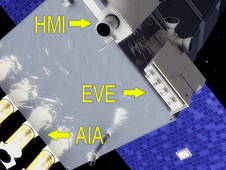 EVE is being built by the University of Colorado, with Dr. Tom Woods of U. of Colorado as the Principal Investigator.